See more Love, Fire Jumpsuits. 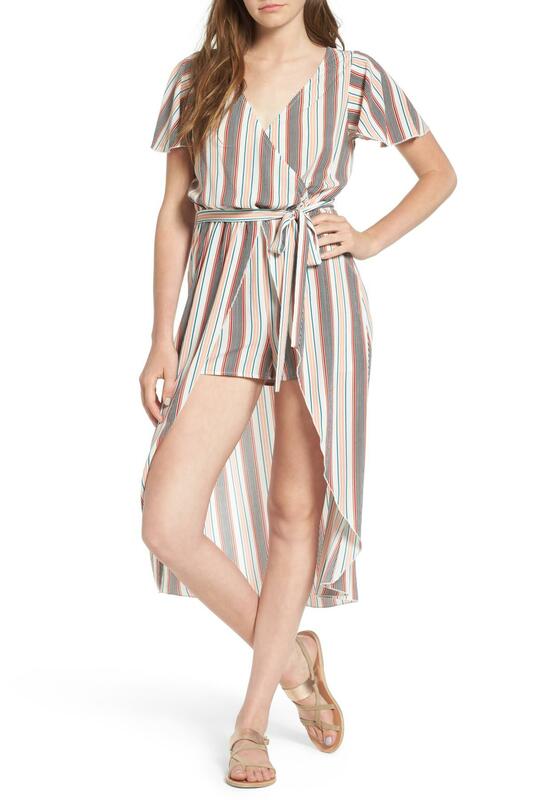 Equal parts flattering wrap dress and flirtatious romper, this pretty little hybrid style feels totally fresh for summer. 26" length; 2" inseam; 24" leg opening (size Medium). Surplice V-neck. Short sleeves. Tie belt. Unlined. 95% polyester, 5% spandex. POLYESTER.. Machine Wash Cold. Tumble Dry Low. True to size. Juniors: XS=0-1, S=3-5, M=7-9, L=11-13.Women's: XS=000-00, S=0-2, M=4-6, L=8-10..